We recall, Mr. President, that for each of the past four years, at this time when we come for annual climate meetings, as our Earth spins to another end and another beginning of her voyage around the sun, a powerful typhoon visited the Philippines, that carved out an immense swathe of devastation, deprivation and death of many of our countrymen – a persistent and rude reminder of the significance of our role and the urgency of our mission in this Conference of the Parties. For the Philippines, climate change means sorrowful catalogues of casualty and fatality; the countless voices of the homeless and the grieving — their very tears and screams carried to us by the winds and waves that blew their homes away. During moments of great violence and bereavement, “victim” is an inadequate word to capture the loss and damage visited upon us. Each body count has a name and an age — is workmate or lover, neighbor or friend, son or daughter, father or mother. It is in this light that the Philippines, together with the rest of the world, welcomes and supports the adoption of this historic Paris Agreement. First, its 1.5 goal has defined the global ambition for climate action. Paris has given us 1.5 to survive and to thrive. We‘ve seen how Parties coalesced around this goal. We shall deliver on this goal. And we thank all the civil society and faith-based groups all over the world that worked hard to secure this goal. This is your victory, too. 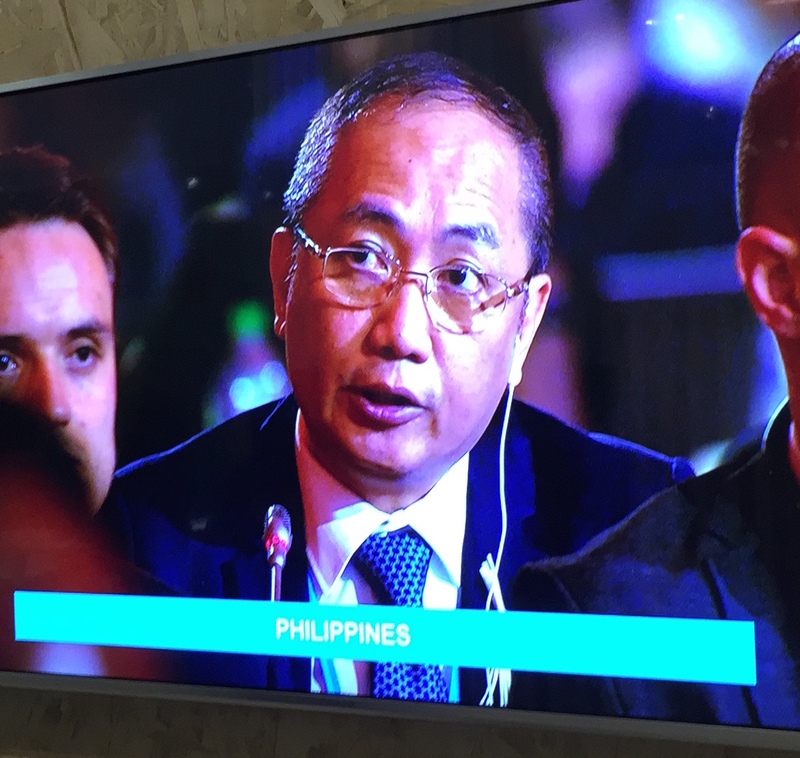 Representing 43 vulnerable countries and a billion people, the Climate Vulnerability Forum, led by the Philippines, will continue to lead and sustain the fight against climate change for a safer future. Second, the Agreement enshrines human rights as its bedrock principle, including the rights of indigenous peoples, women, young people, and migrants, among others. Although we would have preferred stronger language on human rights, we are very pleased that for the first time we have enshrined climate justice in a legally binding international agreement. In adopting the Paris Agreement, the era of climate justice has come. Third, the Agreement ensures ecosystems integrity in climate actions, an element that we are also pleased with. Fourth, the Agreement ensures support in finance, technology, and capacity building for all adaptation and mitigation efforts. While we are already doing a lot on our own to adapt to and mitigate climate change, we are committed to do even more with the support of our partners. We have wanted quantitative targets and more legally binding language on support; but we will continue to work for these as we implement the agreement. Lastly, we joined other developing countries in fighting for the inclusion of a Loss and Damage Article in the Agreement, separate from Adaptation, to secure the permanence of the Warsaw International Mechanism on Loss and Damage. It lays the foundation for what we like to refer to as the WIM Plus: an institutionalized, operationalized Mechanism on Loss and Damage that would ensure the recovery, restoration and resilience of communities, livelihoods and ecosystems adversely affected by slow onset events, extreme weather events and other climate change impacts. We are concerned with paragraph 52 of the decision, and will study its long-term implications. We will engage with partners on this at a later stage. Our Paris Agreement may not be as perfect as we want it to be, but it is essentially an acceptable accord. We can build on it and make it better over time. We must now focus on its implementation and compliance procedures. Mr. President, the Philippines gratefully appreciates your leadership and hard work for this Agreement. You have been a magnanimous leader, attentive to the concerns of the powerful as well as the vulnerable. We thank your team, all the minister-facilitators, the ADP co-chairs, and the UNFCCC Secretariat ably led by Madam Christiana Figueres, for your hard work to forge this Agreement. We especially thank our own G77 and China Chair, South Africa, for the high level of diplomacy and coordination she demonstrated. Mr. President, it is not coincidental that it is in this city, Paris, where the world has finally come together to deal effectively with climate change. Paris is the birthplace of three words: Liberté, Egalité, Fraternité. But there is another French word that comes to mind: Solidarité. Solidarity is not a stranger to Paris. When terrorists attacked this city last month, its people did not give in to baser instincts, nor were they defeated by fear. Instead, the people of Paris reached out to each other, her minorities included, and now, they have welcomed us all warmly with open hearts and arms. Paris is where the countries and peoples of the world, in solidarity with each other, took decisive action against climate change. For these, we thank you, Paris. Merci beaucoup, La France. Despite diversity and divergence, we have found common ground to build our common home. The Paris Agreement is a monumental feat of humanity. Together with the equally landmark Sendai Framework for Disaster Risk Reduction 2015-2030 and the 2030 Agenda for Sustainable Development, adopted last March and September respectively, it provides a vision and pathway for humanity’s future. And now as one family of nations, as sisters and brothers of one world, let us move forward with greater resolve and ambition, hopeful of winning this fight against climate change. Colleagues, let us build together our common home; let us secure together a resilient future for all. Thank you, Mr President. Thank you, colleagues.